Yvette Berry, Shane Rattenbury, Andrew Barr, and Caroline Le Couteur last year at the Assembly with the Parliamentary Agreement, of which the Integrity Commission was a key part. File photo. An ACT anti-corruption body will be in operation from 1 July 2019 after the passing of legislation in the Legislative Assembly. 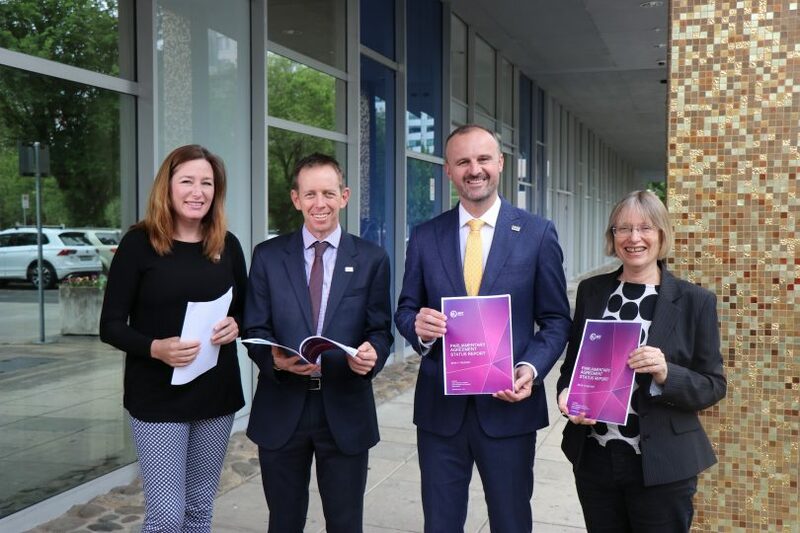 Chief Minister Andrew Barr said the Bill passed with tri-partisan support on Thursday (29 November) would see the establishment of an ACT Integrity Commission modelled on best practice from similar anti-corruption bodies operating across Australia. He said the ACT model would be the first in Australia to introduce a criminal offence for a failure by mandatory reporters to notify the Commission of serious or systemic corrupt conduct. “This sends a very clear message to ACT public sector leaders that the obligation rests on them to maintain the highest ethical standards for themselves and the people that report to them,” he said. The Integrity Commission is a product of the Labor-Greens Parliamentary Agreement and Greens leader Shane Rattenbury was claiming credit for strengthening the definition of corruption with an amendment. “The definition addresses ‘serious disciplinary offences’ and includes serious misconduct, dismissible offences and actions that would lead to significant employment penalties,” he said. Mr Barr said the new Commission would be able to investigate matters that were subject to a previous inquiry and those related to judicial officers – while respecting the independence of the judiciary and the importance of separation of powers. “The legislation also requires mandatory reporting by all senior public servants, members of the Legislative Assembly and chiefs of staff to ministers and the Leader of the Opposition,” he said. Police will also come under the Commission’s purview but this requires agreement from the Commonwealth. The legislation allows for a 12-month hiatus for this to be negotiated. Mr Rattenbury said the passing of the Bill was a significant achievement. “Once the Commission is realised, the people of the ACT can have greater confidence in the integrity, accountability and openness of our politics,” he said. A Commissioner and staff will need to be recruited. The Government also introduced a ban on property developer donations to any party represented in the Assembly. “While ACT Labor and the ACT Greens do not accept donations from property developers, this measure will bring the Territory into line with other state and territory Governments,” Mr Barr said. The Greens said they would support the legislation but said the Government and the Canberra Liberals had voted in 2014 to reverse the ACT’s robust political donation laws. It was only after public funding for elections was significantly increased that the need for donations became less important, although the Greens say opaqueness remains.